We’d love your help. Let us know what’s wrong with this preview of Every Soul a Star by Wendy Mass. Ally likes the simple things in life--laby And as streams of light fan out behind the darkened sun like the wings of a butterfly, I realize that I never saw real beauty until now. To ask other readers questions about Every Soul a Star, please sign up. Now, let's get this straight, What Is YOUR Favorite Character in the book? I'm a teacher and I'm looking for a good book to help kids learn how to read fiction (I know, I know, it seems really straightforward, but I want to help them learn how to read more deeply, including annotating and talking about the elements of fiction and development of the story). Will this be a good book for advanced 7th graders given this goal? I read this book a very long time ago, and I have read it several times since. Why? Because the story is just adorable and it just gives me that "warm fuzzy feeling" on the inside. I read it first in 4th grade, and I believe I have read it every year since. Like, a self deemed classic of sorts, I'm not quite sure. And every time I clear out my bookshelves to make room for new books, this is one of the few that has stayed around through all of the years. Why? The characters. The characters make I read this book a very long time ago, and I have read it several times since. Why? Because the story is just adorable and it just gives me that "warm fuzzy feeling" on the inside. I read it first in 4th grade, and I believe I have read it every year since. Like, a self deemed classic of sorts, I'm not quite sure. And every time I clear out my bookshelves to make room for new books, this is one of the few that has stayed around through all of the years. Why? The characters. The characters make you care about this story. The storyline itself could not have made an interesting book, it needed the characters so support it. And the characters did just that, and so much more. Even supporting characters whom were not one of the main characters were really real and connectable. And it is the way that every character had obvious flaws, and deeper flaws; but they all accepted one another in the end anyways. Maybe that's why- the idea of unlikely friendships. The idea of people not being what there appear to be on the surface. That, no matter how different you are from someone else, they could end up being your best friend. That message is the beauty of Every Soul a Star. No matter how old you are, just sit down and read this gem of a book. It will make you smile. Wendy Mass has a particular style that I think people either get or not. I have to say some of the time I don't get into her books, but I can honestly say I was happy that I read this one. Ally, Bree, and Jack are all very different and under noraml circumstances would never meet, but one event will bring them all together, the solar eclipse. This event will be witnessed at the Moon Shadow which is Ally's home. Bree is being dragged there by force, who wants to commune with the stars anyhow? Jack Wendy Mass has a particular style that I think people either get or not. I have to say some of the time I don't get into her books, but I can honestly say I was happy that I read this one. Ally, Bree, and Jack are all very different and under noraml circumstances would never meet, but one event will bring them all together, the solar eclipse. This event will be witnessed at the Moon Shadow which is Ally's home. Bree is being dragged there by force, who wants to commune with the stars anyhow? Jack is going to fulfill his obligation of making up a class. They all come into the story with different backgrounds and perspectives, and have distinct voices but they all work well together. I think one of the hardest audiences to write for is the middle graders. You can't sound too preacy, gotta keep it interesting, keep it real, but most of all relate to them. It's a pretty trying time and here we get to see how they all come to grow up and learn from each other. I've never taken an astronomy class in my life but I think I got my fill from this book. The author did an excellent job of describing the solar eclipse and I could imagine the thrill they must have had from witnessing one. It is pretty awesome. "Every Soul a Star" is about three teenagers who are brought together by an eclipse during the summer. This eclipse changes each of their lives forever. The story begins with Ally, who is a homeschooled girl that has never truly experienced civilazation. Then the point of view switches to Bree, a true prep thats mantra is to be beautiful - she wants to be a model when she grows up. Then, it switches to Jack, who is a slightly overweight and somewhat awkward guy that failed his science class. It "Every Soul a Star" is about three teenagers who are brought together by an eclipse during the summer. This eclipse changes each of their lives forever. The story begins with Ally, who is a homeschooled girl that has never truly experienced civilazation. Then the point of view switches to Bree, a true prep thats mantra is to be beautiful - she wants to be a model when she grows up. Then, it switches to Jack, who is a slightly overweight and somewhat awkward guy that failed his science class. It continues to switch point of view between these three lively and very different characters. Wow! This was a great book. On reflection, it was not a great book for the usual reasons. The plot was pretty typical for the young adult market. The characters, although varied and somewhat three dimensional, were still stereotypes. The theme was the usual, again especially for young adult books. The parent-child interactions were for the most part overbearing, and the teens were definitely lacking in power in their day-to-day lives. Family members were depicted working against each other inste Wow! This was a great book. On reflection, it was not a great book for the usual reasons. The plot was pretty typical for the young adult market. The characters, although varied and somewhat three dimensional, were still stereotypes. The theme was the usual, again especially for young adult books. The parent-child interactions were for the most part overbearing, and the teens were definitely lacking in power in their day-to-day lives. Family members were depicted working against each other instead of together, and things that should have been shared were kept secret. The setting was nice, but there were no vibrant descriptions bringing it all to life for me. Those are the reasons I gave this book four stars instead of five. Natural phenomenon lend themselves to children's literature. Picture books, for example, are filled with fireflies, rainbows, and shooting stars. Then the child readers get a little older and the phenomena get more complex. The death of the atom in Smiles to Go or the frozen lake of melted radioactive sand in The Green Glass Sea (okay, so maybe that one's not so natural). And I'm sure, I am sure, that a novel has been written with an eclipse at its climax. Odds are that such a book would be a Natural phenomenon lend themselves to children's literature. Picture books, for example, are filled with fireflies, rainbows, and shooting stars. Then the child readers get a little older and the phenomena get more complex. The death of the atom in Smiles to Go or the frozen lake of melted radioactive sand in The Green Glass Sea (okay, so maybe that one's not so natural). And I'm sure, I am sure, that a novel has been written with an eclipse at its climax. Odds are that such a book would be a fantasy novel. I've never heard of one, but it makes perfect sense for people to be racing against an eclipse so as to close the portal on another dimension, etc. etc. etc. Boring! You know what's exciting? Realistic eclipse fiction like Every Soul a Star. Once again author Wendy Mass takes a crack at science and the idea of questioning a world that you may have taken for granted until now. Entirely engaging and oddly thrilling, this is one contemporary tween novel that's just begging for the right booktalk. The narrative is split between three kids as different as different can be. Two of them, however, have the exact same problem and that has to do with Moon Shadow Campground. For most of her natural born life Ally has lived on the campground far away from the rest of society, just the way she likes it. Now she's found out that her parents have sold the place to someone else and soon she'll have to move. That someone is Bree's family and as much as Ally doesn't want to leave, so too does Bree not want to stay. She's the queen bee of popularity at her school and the notion of spending a couple years surrounded by just rocks and natural beauty is horrifying, to say the least. In the midst of this problem arrives Jack, a self-conscious artistic type who has come for the total eclipse of the sun along with thousands of other tourists. Topping it all off is an event that changes how they see themselves when all the lights go out. Backmatter consists of an Author's Note and websites and books for further reading about the night sky. I was curious to see that though four kids are hanging out in this book, only three were allowed a voice. Poor Ryan. He's a character that has been friends with Ally for years, but is suddenly far more interested in a girl as fashion conscious as Bree. One gets the vague sense that had he proved to be a more interesting person, maybe he could have earned himself a narrative. As it stands, he's just your normal everyday teenaged doofus. A nice guy, sure, but no one you'd feel the need to enter the head of. Ally talks to stars as if they were her friends, so that makes her interesting right there. Jack hasn't so much as a whisper of self-respect at the start, and that's a starting point. But it's Bree that turns out to be the surprise. I know that some girls are completely obsessed by Gossip Girl and Clique and those other books with their amusingly vapid heroines. Well if you ever see one of these readers, try convincing them that Bree is the same kind of creature. Her goal in life is to be discovered and to become a model, so to watch an otherwise missing brain slowly morph into a decent human being over the course of 322 pages . . . now that's a natural phenomena for you! Mass does two important things with this novel. First off, she creates two entirely convincing opposite perspectives. Bree and Ally are both sympathetic, but for vastly different reasons. And as much as you'd like to continue to dislike Bree for most the book, she's a person who is easy to understand. I'm not entirely convinced that her conversion at the end of the book is anything but a pretty blatant example of deus ex machina (or, in this case, deus ex telescope) but I'm willing to let it go. The second difficult thing Mass does is to (I hate this phrase but I can't think of a better one) make science interesting. Because she really does. The part of the human brain that contains a capacity for a natural sense of wonder would have to be dead if the person finishing this book wasn't filled with a wholehearted desire to see a total eclipse of the sun. I've never wanted to see one before but after reading the description in this book I'd hop the next train if you told me one was in the general vicinity. I always enjoy a kid's book that works against my natural expectations of what's going to happen next. I mean, look at this equation: Popular girl meets unpopular girl at campground. There are only a couple of different ways you can go with a storyline like that, so Mass gets points for taking the road less traveled. For one thing, the kids in this book get along. I sort of expected this to be a novel where people fought, bickered, and came to learn about themselves through conflict. But this is a little different. The kids have essentially been tossed out onto their own by the adults in their lives, or have left those adults voluntarily for the first time. Adrift they end up clinging to people in similar situations. And Mass toys with her canny readers, TOYS I say! You simply cannot have a boy reading the Ray Bradbury story All Summer in a Day (it's never named but you know that's what it is) in the first act without implying that something similar is going to happen to him in the third. I won't give anything away, but it's nerve wracking to say the last. Ally is one of the few homeschooled heroines I've found in middle grade fiction lately. That's neat. It's nice to have a detail like that interwoven with a tale about the death of the sun and that equally awesome event, our entrance into teenagerhood. And I really do think that you could sell this book equally well to the kid who loves books about science and realism as to the kid who'll only touch titles that contain fashion forward females. I could be wrong, but I think it's worth trying. Give it a look yourself. It's a pretty neat juggling act. If you haven't read this one, I highly suggest that you do! This book revolves around three pre-teens -- Ally, Bree, and Jack -- who all have different personalities; each are different and unique and very adorable. Coincidentally, they all end up in the Moon Shadow Campground to see the upcoming solar eclipse, and during their stay at the campground, the three of them form friendships and closure none of them obviously expected before. Every Soul a Star is not only a book about astronomy, astrology, and the heavenly bodies that float above us, but also a book about friendship and acceptance. 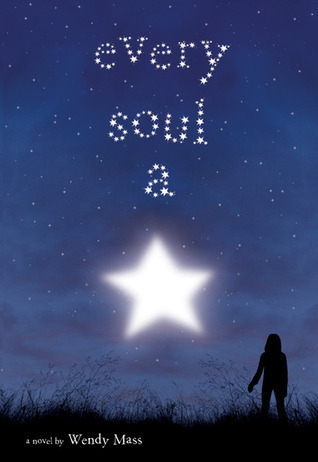 Every Soul A Star is a simple but profound book for teenagers. A simple story line, but I like it because I learned about stars gazing, moon shadows, etc. In a nut shell, if you ever been bored about astronomy, why don't you give this book a try? I find the book, even somehow similar to other young adult novels, somehow, it feels some sort of coming of age for these three important characters - Ally, Bree and Jack. Because in Moon Shadow campground, their life will be intertwined with each other. A Every Soul A Star is a simple but profound book for teenagers. A simple story line, but I like it because I learned about stars gazing, moon shadows, etc. In a nut shell, if you ever been bored about astronomy, why don't you give this book a try? Look--don't ask me why I read Every Soul a Star, because I really don't know. I bought a copy of it at the Scholastic book fair back in December, simply because the cover was attractive, it was cheap, and it looked like something my students might want to read. I took it back to my classroom and put in my library. Whenever kids would come back to pick out a book, I'd always steer them in the direction of this one, saying, "Hey, doesn't this one look good?" After it sat on my shelf for a few months, I finally chucked it into my briefcase and decided to take it home with me. It seemed an appropriate antidote to The Witches of Eastwick. Every Soul a Star is a wonderful middle-grade novel. The narrative centers around a full solar eclipse and a small collection of stargazers who are drawn to a campground in the middle of the American west to witness it. Along the way come three teenagers, each with his or her eccentricities and secrets. In the end, as you might imagine, they mature and become irreplaceable friends. Every Soul a Star was split into 3 POV’s, Ally, Bree, and Jack. Ally’s family owns Moon Shadow, a isolated campground, she loves being outdoors and doesn't care about her appearance, but then the Holden's, Bree’s family came. Bree is popular and lives in the suburbs, she has to move to Moon Shadow and own the camp. She did want to be a model, but outdoors, fashion, and getting service to be popular do not mix. Jack has summer school but can go on a trip to see the eclipse instead. In class, he Every Soul a Star was split into 3 POV’s, Ally, Bree, and Jack. Ally’s family owns Moon Shadow, a isolated campground, she loves being outdoors and doesn't care about her appearance, but then the Holden's, Bree’s family came. Bree is popular and lives in the suburbs, she has to move to Moon Shadow and own the camp. She did want to be a model, but outdoors, fashion, and getting service to be popular do not mix. Jack has summer school but can go on a trip to see the eclipse instead. In class, he stays in the corner of the class and draws instead of paying attention. Then when opportunity knocks, and soon they find out a lot about each other. I thought the book was very intricate and compelling, it kept me in the edge of my seat. I think this because each character changes or develops a different side of them. As I said before they all have different traits, but they slower found that they had a completely different side of them. All because they helped each other out. I would rate Every Soul a Star a 4 out of 5 because I didn't like the way it ending turned out the way it did. I thought it would of taken place a year later in the Epilogue. I really liked this book. It was not that "edible" but it whetted my interest. Three lives changed because of one event that brought them together. This novel taught me that we should always put ourselves on the limelight because we would always be our own heroes. Bree. Her transformation helped me understand that superficial beauty was really just that. I must not categorize people and base my dealings with them through their labels. (Life is a package deal). Thank you, Bree. I learned with you. I really liked this book. It was not that "edible" but it whetted my interest. Three lives changed because of one event that brought them together. This novel taught me that we should always put ourselves on the limelight because we would always be our own heroes. Bree. Her transformation helped me understand that superficial beauty was really just that. I must not categorize people and base my dealings with them through their labels. (Life is a package deal). Thank you, Bree. I learned with you. Ally. I transformed with her. She was a constant being. She loved the universe and everything outside the earth including the space junk. She was so caught up with these things that she wasn't aware of the civilization within the Earth itself. This novel taught me that each of us are like stars, that we're like a vast universe shining on our own colors, living our own lives, giving off our own heat, and twinkling on our own rhythm and pace. Life's like these. Learnings aside, this novel made me watch documentaries about our solar system and the universe on youtube HEH! I missed my science classes when i was in grade school especially old times like eclipse watching on school fields while using my folks X-ray films and camera films, going to science centrum, and seeing the stars through telescopes on girl scout campings...Those were the expensive experiences I wont trade for anything. This is a good story of friendship and self-discovery. Three teens were unexpectedly changed as circumstances led them to Moon Shadow campground, the best place to view this year's eclipse. Ally have lived here all her life and couldn't ask for more. How will she handle it when she finds out they are moving out? Bree, a self-centered model wannabe, received the shock of her life when her family decided to move away from civilization and be the next caretakers of the camp. How will she adjust to This is a good story of friendship and self-discovery. Three teens were unexpectedly changed as circumstances led them to Moon Shadow campground, the best place to view this year's eclipse. Ally have lived here all her life and couldn't ask for more. How will she handle it when she finds out they are moving out? Bree, a self-centered model wannabe, received the shock of her life when her family decided to move away from civilization and be the next caretakers of the camp. How will she adjust to this kind of life away from all the glamour? Jack, a pudgy boy with low self-esteem, agreed to be his science teacher's assistant to get away with summer classes. Totally oblivious to his role, he will do anything not to mess up. The characters in this story can be annoying at times, but understandable. I liked all the information on stars and space found throughout the book although I hard a hard time imagining how the eclipse looked. I bet there are just some things that you have to experience yourself so that you can appreciate it. I think there were times when too much information was dumped that made me confused or bored. This story leads to an absolutely mesmerizing climax. I loved the multiple inversions of Bradbury's "All Summer in a Day", too -- a deft touch. I suppose my only complaint -- and I'm stretching here -- is that if I were to recommend this book to a young woman like Bree (in an effort to get her to appreciate science or to encourage her to nurture her "inner geek") then my effort would seem very transparent to that young reader -- because Bree herself, insofar as she is a mouthpiece for the author' This story leads to an absolutely mesmerizing climax. I loved the multiple inversions of Bradbury's "All Summer in a Day", too -- a deft touch. I suppose my only complaint -- and I'm stretching here -- is that if I were to recommend this book to a young woman like Bree (in an effort to get her to appreciate science or to encourage her to nurture her "inner geek") then my effort would seem very transparent to that young reader -- because Bree herself, insofar as she is a mouthpiece for the author's inner geek, is transparent. In other words, Bree is a sympathetic, believable character except for those moments when the author seems to be trying directly to tell the reader that loving knowledge and science is a Good Thing. In those moments, Bree stops being a person (it seemed to me) and became the author's educational puppet. But, like I said, I'm stretching. Really, I think in those moments Bree is still very believable. The effort just seems transparent to me, even though I agree that discovery and knowledge are Good Things and should Be Pursued. Every soul star is about three kids named Jack, Bree, and Ally. Jack is a character that is laid back and likes to play a lot of video games you could also say he's lazy. Bree is the popular one and is so beautiful and knows she wants to be a model when she growls up. Ally is the sweet and simple girl and she enjoys looking at the stars and enjoys life in general. In the summer they are all going to Moon Shadow which is a summer camp, to see an eclipse of the sun. It turns out that, that's not a Every soul star is about three kids named Jack, Bree, and Ally. Jack is a character that is laid back and likes to play a lot of video games you could also say he's lazy. Bree is the popular one and is so beautiful and knows she wants to be a model when she growls up. Ally is the sweet and simple girl and she enjoys looking at the stars and enjoys life in general. In the summer they are all going to Moon Shadow which is a summer camp, to see an eclipse of the sun. It turns out that, that's not all they thought would happen there. They come together and find themselves in a situation they never would have thought of. Especially being friends with each other. They share with one another what they know how to do because they have different perspectives of thing and have different ideas, but and together they make a great team. 5 stars - Books that blew my mind and that I'll definitely reread/recommend. 4 stars - Not quite as mind-blowing as my favorite books, but still worthy of a reread. 3 stars - Pretty good books that I enjoyed but aren't in my list of top favorites. May reread. 2 stars - Books that are anything but great, but that I'll give more than one star. 1 star - This is reserved for truly awful books that I would never, ever recommend or reread. Ally lives at a campground. She does not want to move to the city. The stars can't be seen there, and she's been searching for the Messier Objects, which can hardly be seen from where she lives! Bree has a life, and she likes it the way it is. As far as she's concerned, school is only there for popular people like her to practice looking good so they can be models someday. Jack is a misfit with a talent for art. He failed science, and is looking for any excuse to get out of summer school. They get Ally lives at a campground. She does not want to move to the city. The stars can't be seen there, and she's been searching for the Messier Objects, which can hardly be seen from where she lives! They get brought together by the weirdest chains of events, and none of them expects what happens next. This book is about three totally different kids who would never speak to each other at school, who meet each other under weird circumstances and change everything. I read this on the recommendation of my 10 yr old who told me I would love it. It was a great young adult novel and had really good messages about being true to yourself, the importance of family, and the coolness of science!! I was pleased that it touched my daughter and now we have another book to discuss and share together. I only gave it 3 stars but if I were 10 yrs old I might have given it 4 or 5! This book was really interesting from the beginning. Lots of books lose my attention really fast, but this book kept my attention without being over-action-filled and pointless. I would recommend this book to others. Psych! I did not completely read this book. I stopped a long time ago because it was too boring. It might be catered to readers who enjoy slow-moving plots and boring, predictable characters, but it wasn't my fav. Maybe I'll read it again when I want something to immediately put me to sleep. There is just something about this book that warms my heart. I love how it is realistic fiction but yet tells you all these great facts. I learned so much just by reading this book. I think it shows the true meaning of love (as in brother and sister love). I highly recommend this book!! OMG this book is amazing thats all i can say to it. I really wanted to like this book, since I've read a couple of Wendy Mass's books and really enjoyed them. Not to mention the cover is gorgeous. And I thought I was going to, when a line on the first page said, "...you just have to read the right books, and it's all there. When you're homeschooled, you have a lot of books." YESSSSSS. Homeschooled characters are few and far between, and I, a homeschooler, am always happy when I stumble across one that's well-represented. This one, sadly, wasn't. I'm sure you can imagine my dismay when I kept reading. (I'm cutting some pieces out for the sake of brevity. I'll mark them with ....) "I know all the constellations because my father taught them to me, and I know about the Alpha because it is also my name. But my family and friends call me Ally. The fact that we live somewhere with a hot spring outside our house pretty much explains why I don't have friends nearby. Basically, my house is as close to the middle of nowhere as a person can get and still be somewhere. Our town is not even on the map. It's not even a town. It's more of an area. ... The nearest real town is an hour away. Sure, maybe it gets lonely here every now and then, but I love it here. I was only four when we moved, so I don't really remember life in civilization, which is what my ten-year-old brother, Kenny, calls anywhere other than here. It should be pointed out that Kenny's only knowledge of civilization besides our books is based on what he can glean from the ancient black-and-white television at the general store, and since the only show that comes in is the soap opera Days of Our Lives , he thinks civilization is very dramatic. And until a few years ago, he thought it was in black-and-white." Hooray for unsocialized homeschoolers!! *facepalms* Someone come help me. I'm being overwhelmed with stereotypes. It turns out Ally's family doesn't have phones, phone service, a TV, etc... And Ally doesn't know what texting is. I know some people think that homeschoolers aren't socialized, but I'm pretty sure most of us know what texting is. Am I right? Am I right??? Oh, and their parents kept them up-to-date on "current events". I'm pretty sure cell phones/texting were current events... years ago. Okay. *breathes* I'm done ranting about that, but there were a few other issues I had with the book. Bree is an absolute brat for most of the book, although (view spoiler)[ she has some redemption at the end (view spoiler)[ For most of the book, she really got on my nerves, though. She goes to a modeling class at the library without her parents' consent and has a really bad attitude towards them the entire book - and she never gets in trouble. Grrrr. I also thought Ryan was really shallow and kind of a jerk. (view spoiler)[ He deserves Bree. (view spoiler)[ Probably my favorite POV character was Jack, even though he had a bit of an attitude. Another thing I didn't like is that it was written in first person present - alternating between three characters. Someone halp. I've been reading so many first-person-present books I'm starting to think in first-person-present. But the book certainly wasn't all bad! It had practically no bad content (violence, cursing, etc. ), and was a fairly good, clean read. I really enjoyed some of the descriptions, particularly (view spoiler)[ at the end when the eclipse was going on. What Jack did was really sweet <3 (view spoiler)[ I also enjoyed the interactions between the kids. Overall this book was a little spoiled for me because of some of the stereotypes, but it had some really cute themes in it. I wouldn't hesitate to read another book by this author. This book pushed so many of my own personal buttons, I struggled with near-chronic impulses to choke the negligent, self-centered, insensitive parents scattered throughout it, to death, while reading it! It's tough to know just how oblivious the author truly is on the topic of radical, childhood moves, especially as regards the health and positive impacts of the developmental stages of adolescence vs whether she already fully understands these concepts and wanted to pretend they are generally insignificant and benign (complete BS, as I've been there, done that, and have known many others who got drag unwittingly through those horrors, as well). Every single child in this book is being profoundly emotionally abused and generally neglected by their parents (parents of both intact marriages and divorces), though the author refuses to acknowledge those facts in any manner - merely glossing over the harm each child has suffered at the hands of incompetent, indifferent, insensitive, self-centered parents. One set of parents completely isolates their children from any sort of contact with any other children, apart from those who very temporarily stay at their very isolated campground, during summers. These two kids never learn any socialization skills (apart from the barest necessities needed for very temporary contacts with people of all ages, during the summers), are home-schooled (but only on subjects their parents know/appreciate, thus music [vocal and instrumental], art, theater/drama/speech/debate skills, library skills, computer skills, travel skills, telephone skills (beyond the most rudimentary), hygiene/grooming skills, popular culture skills, spirituality/religion/politics/current events knowledge and skills, emergency and first aid skills, child care skills, second language skills, career-planning skills, athletic/PE skills, shopping skills and typical advertising ploys, standard medical and dental health routines and procedures, financial management skills, lifecycle event skills, (how to handle births, christenings, anniversaries, birthdays, major holidays, puberty management, graduations, hospitalizations, weddings, funerals, house-warmings, etc. ), long-term friendship-building skills, and so much more are completely left out of the "curriculum". Instead, Ally and her brother are both severely socially, culturally, and educationally delayed (functioning many years younger than their chronological ages - though they don't realize this, at present - and neither would be safe to be out of direct supervision by an adult or much older adolescent, at every moment of every day, once placed within any American city). Not only have Ally and her brother been restricted from learning how to safely function around strangers in both familiar and unfamiliar environments, they've been forced to work seven days/week, day and night, year-round, as unpaid laborers for their parents. They only know how to work and do their homeschooling tasks, leaving them fairly clueless about how to play, especially group games or athletic ones. These facts (along with their lack of knowledge regarding popular culture), will make them major social freaks/oddballs, regardless of wherever they are forced to move. Their parents set them up to be hopelessly ignorant about so much of the world/standard American culture, that the only socialization "choice" they will have is within some sort of hiking club or star-gazing club and there are very few cities which have those kinds of clubs for kids their ages. The same inept/cruel parents never bothered to warn their children, at any time, that their campground lifestyle was merely a temporary one - despite the fact that their beloved, though now deceased, grandfather had been involved in the building of the campground, as had the entire family, for many years. So, they'll be leaving behind their grandfather's greatest creation (and their memories of him there), the stars which are the center of the family's intellectual interest, and years of personal hard labor and creations that they had been forced to build and care for, year-round - growing to love in the process but only so now someone else could take full advantage of them. Then, the news is abruptly "sprung" on the kids that they are moving far away, when the new owners arrive with their own kids and all their earthly possessions, ready to move in! Amidst all this, the crazy first set of parents both expect their kids to take all the news in stride, keep up with their endless lists of chores, and be good friends to the new kids who will be taking possession of their rooms and most favorite, secret places. These stupid parents know nothing about grief and couldn't care less how well or poorly their offspring are dealing with the news. Instead, these parents are all too excited about the hundreds of new campers arriving and the fabulous show they are planning for them, to think about anything else. Their kids, as usual, are the lowest topics on their minds. I've never wanted to personally kill book characters before, until now, starting - but not ending - with these two bozos! Then, we have the "delightfully dense marital duo #2" who have two daughters whom they have been ignoring, both physically and emotionally, for years, though they've lived in a stable, supportive community. Their eldest daughter, Bree, is never expected to fully relate to her parents where she is going, what she has been doing or is planning to do, who her friends are, what her school days and extra-curricular activities are like, what direction her relationships with boys and her own sexuality are going, who has been transporting her or who she has been transporting (or what they were imbibing, prior to driving events), what her academic and/or career interests are, what her personal values/beliefs and future life goals are, nor much of anything else that is important. She is allowed to wear virtually anything she feels like wearing (and/or has learned how to sneakily wear switch into in as many settings as possible), do anything she pleases with her hair, skin, and nails, eat as little as she wishes without regard for her nutrition/fluid status, obsess endlessly on her appearance and desire to be a future model, refrain from performing any sort of household chores or work for pay outside the home, fight endlessly with her younger sister (whom she despises as the younger daughter is viewed as highly intelligent, thus "geeky"), and show disdain toward all of her family members and most authority figures, unless she is attempting to manipulate them to get what she wants. In a virtually identical copy of Ally's parent's grandly deplorable, thoughtless, and impulsive maneuver, Bree's parents inform her that in just a few days, their entire family will be moving thousands of miles away, for at least three years (perhaps longer), so that the parents can conduct a mutual research project they've been working on (the property and campground was purchased sight unseen - a clear sign of a majorly foolish decision. ***Bree's parents have conducted so little personal research on the campground and its surroundings*** that they have absolutely NO IDEA how blocked in they will become, once the winter snows arrive, nor do they have any idea what venomous animals/insects are in the area, how to identify them, or how to treat the injuries that may arise from them. They don't have a clue about the carnivorous animals in the region, either. How will they handle those if their family or some campground guests become threatened by them??? Do they know how to track wild animals? Do they know how to search for lost campers? There's nothing in the book that in any manner indicates that either of Bree's parents knows anything about either wild animals or domestic ones - let alone how to cope with them should they become ill, injured, or threatening (think rabies). to protect themselves or the campground during perilous weather. They seem to have no clue how far away the nearest MD and/or hospital is or whether there is any law enforcement/fire-fighting field office anywhere within the nearby vicinity to call, in case they, a camper, a lightening storm, and/or a stranger should become problematic. As there is no cell phone access, they will be completely dependent upon landline service and/or HAM radio communications. How many of those resources are available and do they know how to repair them, if they go down in a storm? How do they get their mail and how often does it arrive? Must they do their grocery and other shopping by mail/internet or is there a grocery/hardware store within reasonable driving range? Alpha "Ali", Bree, & Jack --- three 13 yr old kids that didn't know each other before this summer. But the prime viewing spot for the upcoming total solar eclipse would bring them together in more ways than one. Ali, a super-fan of everything astronomy, helps her family run the Moon Shadow campground, the prime viewing spot for the upcoming total solar eclipse. Bree, a fashion model wanna-be, is the outsider in a family of geniuses. Jack, a pudgy social outsider, failed science class which l Alpha "Ali", Bree, & Jack --- three 13 yr old kids that didn't know each other before this summer. But the prime viewing spot for the upcoming total solar eclipse would bring them together in more ways than one. Ali, a super-fan of everything astronomy, helps her family run the Moon Shadow campground, the prime viewing spot for the upcoming total solar eclipse. Bree, a fashion model wanna-be, is the outsider in a family of geniuses. Jack, a pudgy social outsider, failed science class which landed him in summer school. Ali's dad accepted a new science job in Chicago, & they leave the campground after the total eclipse event. Bree's parents have accepted the job as the new campground owners, & have decided to move in a week early in order to view the total solar eclipse. Jack's science teacher has offered him a position as his assistant on his summer trip to the campground in exchange for not having to go to summer school. They, along with 3 sidekicks, build a life-long bond while conducting a science experiment in Mr Silver's unexpected absence. These are the events that brought the teens together. The eclipse experience is what locks each other in their memories forever. I love a good "coming of age" story. Make the common factor of the teens a total solar eclipse experience....gold! This is definitely a young adult read intended for 12-16 yr olds, but it's a story for all ages. The kids' description of the major changes in their lives, watching the story of an unlikely friendship unfold, & seeing how an astronomical phenomenon can bring the entire story to a point in what made this story so special. Each of the characters are special in their own right, but their story together was my favorite. This is a fun middle-grade read. I'd read it once before, back in 2012 and yes, I remember what year it was because this is the book that first made me aware of the solar eclipse that's coming up in a few weeks and I remember thinking, how am I going to wait 5 years for this??? In a lot of ways, it's a very stereotypical coming-of-age-ish story. There's the popular girl; the slightly overweight shy kid; the weird, but lovable astronomy nerd; her super-attractive best guy friend who has recently d This is a fun middle-grade read. I'd read it once before, back in 2012 and yes, I remember what year it was because this is the book that first made me aware of the solar eclipse that's coming up in a few weeks and I remember thinking, how am I going to wait 5 years for this??? In a lot of ways, it's a very stereotypical coming-of-age-ish story. There's the popular girl; the slightly overweight shy kid; the weird, but lovable astronomy nerd; her super-attractive best guy friend who has recently discovered just how attractive he is; etc, etc. But the setting is fairly unique — a campground in the middle of nowhere that happens to be the only spot in the continental U.S. from which to view an upcoming total solar eclipse. For that alone, I gave it an extra star, because I was the weird but (hopefully) lovable astronomy nerd as a kid, and I kind of still am. My only nitpick, really, is that Bree (the popular girl) seems just a little too stereotypical. For example, she talks about the A-Clique, the B-Clique, and the C-Clique at school, and how one girl was dropped from the A-Clique to the C-Clique for wearing white after Labor Day. Now look, I'm not saying there aren't cliques in middle school. Hello, I used to be a middle schooler. What I am saying is I wish the author would have come up with some slightly more authentic, less over-the-top ways to describe the whole popularity game. Every Soul a Star is a realistic fiction novel that I would use in fourth grade as a read aloud. Students may need scaffolding before reading due to the science terms used throughout the novel. Every Soul a Star is about three teenagers who live very different lives but all come together at Moon Shadow Campground. Ally, Bree, and Jack, unlikely friends, learn from each other when their worlds unwillingly collide. They work together to collect data in hopes of proving the existence of an exoplanet Every Soul a Star is a realistic fiction novel that I would use in fourth grade as a read aloud. Students may need scaffolding before reading due to the science terms used throughout the novel. Every Soul a Star is about three teenagers who live very different lives but all come together at Moon Shadow Campground. Ally, Bree, and Jack, unlikely friends, learn from each other when their worlds unwillingly collide. They work together to collect data in hopes of proving the existence of an exoplanet. Through this adventure and their time together at Moon Shadow, the teenagers teach each other about life. Ally learns more about the world outside of Moon Shadow and how to be a part of it. Bree realizes her love for science again. And Jack becomes more confident and responsible. You could use this novel to complete a compare and contrast activity on Ally, Bree, and Jack. The characters are very different, but they have common treads that make their friendship really strong. This book also discusses many different science topics including sundials, constellations, eclipses, comets, asteroids, and meteorites. Students could research and write about the astronomy included in the novel.